Our new blog series, A Day in the Life, is a look into the life of a Kadence Collective Salesforce developer, Salesforce consultant, project manager, business analyst, marketer, and more. These articles provide some clarity about the work and lifestyle of each if you are interested in learning more about a career in technology and/or a career related to Salesforce. We believe in educating the future of our field, so one day they may choose to pursue a career in technology that blazes trails. Today’s post is a glimpse into the everyday life of one of our Salesforce developers, Kunal. 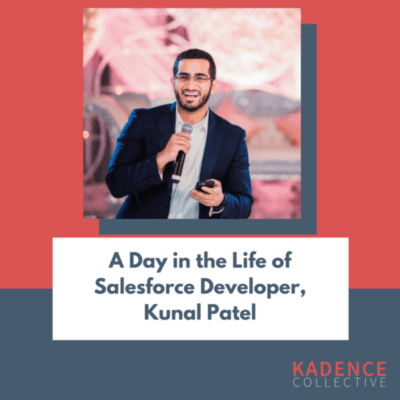 My name is Kunal Patel, and I’m a Salesforce developer at Kadence Collective. I am from San Marcos, Texas, a town between Austin and San Antonio. I attended the University of Texas Austin (go Longhorns! ), where I learned how to code, and graduated with a degree in Software Engineering. While I was applying for developer jobs after graduation, I became interested in coding in the Salesforce platform, and I was hired as a Salesforce developer at Kadence Collective. I spent my first two weeks of work shadowing Tim and Rob, the Managing Directors at Kadence Collective, and getting used to coding in Apex (which is very similar to Java). I remember Rob telling me “You know Java? Then you can learn Apex.” Since then I have learned to code in Apex and SOQL. 7:15 am – I wake up, drink coffee and get ready for the day. I live about an hour away from Kadence’s office, so on Tuesdays and Thursdays I work from home and on Mondays, Wednesdays, and Fridays I go to the office. 9:30 am – I arrive at the office. All of us at Kadence Collective are really good friends, so I make sure to greet everyone and have a quick conversation with Moses, another Salesforce developer about his weekend. 10:00 am – I make my way to the conference room for a planning team meeting where the entire team gives updates on project status and deliverables for each client. These team meetings are really important because often there are multiple people handing off tasks for each client. For example, when a client requests a customization for their Salesforce environment, the project manager first checks if a Salesforce consultant can create the customization with declarative development (points and clicks). When the customization requires code, a case is often assigned to a developer (me). Once I’m done working on the case, I send it over to our quality assurance team to make sure it all works according to the design specifications communicated by the consultant and project manager. The entire process can span days to weeks, and since it passes through the hands of several team members, planning meetings are an essential part of my role. 10:30 am – I leave the planning meeting understanding the highest priority tasks that need to be completed. Then, I begin coding. I’m currently coding a user interface for an insurance software company, where the end user will be able to see a drop-down menu that references data to compare insurance rates. One of my favorite aspects of working as a Salesforce developer is the creative freedom in solving a problem, since there are several ways of doing so – in this case, I can either create a simple table, a dynamic table, or a completely custom UI. 1:00 pm – Lunchtime. I make my way to the common area and pour myself a bowl of Cinnamon Toast Crunch that Diane, the office manager, got for me on her last store run. Our common area is usually stocked with everyone’s favorite snacks and drinks. 2:00 pm – I get on a call with the insurance software company, and give them an update on the user interface that I am building. Although my role is not entirely client facing, I have daily calls and emails with clients when their Salesforce environments are fully customized. One of the challenges of working as a Salesforce developer is becoming knowledgeable in each client’s specific industry. Aside from knowing how to code, we also need to become experts in our clients’ businesses. 3:00 pm – I switch to coding for a client in the finance industry, and I realize that I have found a roadblock. After trying several ways to solve it, I decide to ask for help from Rob – he has been working in Salesforce for a very long time and is always helpful. After 10 minutes, he finds a solution, and I make sure to take notes. I know that there is always something to be learned in Salesforce. Since it’s a cloud-based software, it’s constantly being updated – which can be both beneficial and challenging as a Salesforce developer. 6:00 pm – I leave the office a little late in order to avoid rush hour on my way home. I usually listen to a playlist on Spotify or a podcast on my drive home. 7:00 pm – I eat dinner and relax by playing NBA 2K on my Playstation until 10 pm when I go to sleep. My job as a Salesforce developer is very challenging, but I’m always learning and growing. My great team members, office setting, and our Managing Directors make my job very rewarding. You can connect with Kunal on LinkedIn for more information about his work as a Salesforce developer. Kunal is a Salesforce Developer for Kadence Collective.